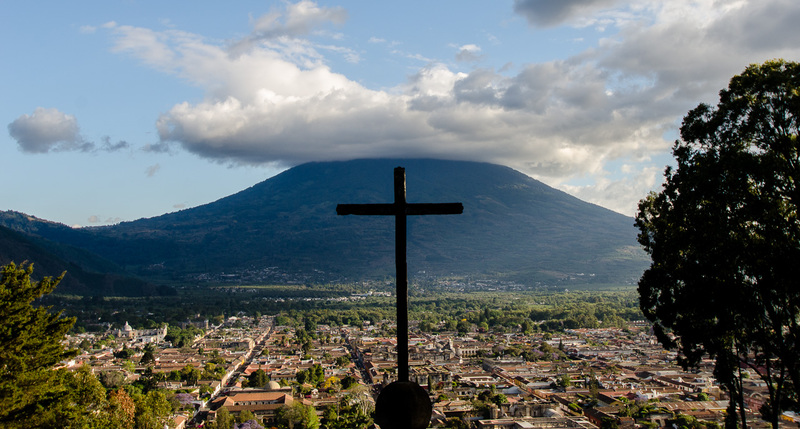 We saw the volcanoes in Santiago Atitlan when we woke up, and in Antigua at the end of the day. Spectacular, immense and jaw-dropping. In between this there was a rather fun boat trip. It started off calm, but the wind got up and it got a little choppy, with the spray entering the boat. To avoid getting soaked I dived into the bow area where the bags were and most of the water went over me. Not so good for a few of the others as they got soaked. Get the hotel to make classic sandwiches with local bread, cheese and ham for lunch to eat later in the day – the Guatemalan element. Put them in the front of the boat and get an oblivious Englishman to lay on them for 20 minutes whilst being rocked on the waves – the British element. On serving, serve with cold stares and humble pie. We’ve been treated to some wonderful views today, and I am sure I saw a plume of smoke from a volcano – can you spot it in one of these shots?